Internet Explorer 9.0 provides many new features including improved support for CSS3 and HTML5 and dramatic improvements in graphics performance. In earlier versions of Internet Explorer, drawing 1000+ graphics performed poorly compared to browsers like Firefox and Chrome. At IE9, graphics drawing performance is much improved over earlier versions of IE and is comparable to other browsers. We created a simple test case that draws 1000 graphics on the map to test the performance improvements in Internet Explorer. This table shows the results of one test run, in milliseconds. Internet Explorer 9 now supports CSS3 behaviors like rounded corners, media queries, transforms and more. View this sample in Internet Explorer 9 to view these behaviors. Internet Explorer 9 enhances HTML5 support, now you can take advantage of capabilities like the Canvas Element and Geolocation. The HTML5 Canvas Element is a space on the page you can use to render images on the fly. Click here to view a sample that demonstrates using the Canvas Element to draw a raster image. The Geolocation API which can be used to find the user's current location is now supported across all major browsers. You can test this using the Geolocation sample. For more details about CSS3 and HTML5 support in IE9 visit caniuse.com. Version 2.3 includes snapping support so you can build applications that include snapping to edge and vertices. When defining snapping the developer can specify various options including the key used to enable snapping and a custom snapping symbol. This release includes several samples that show how to enable snapping. 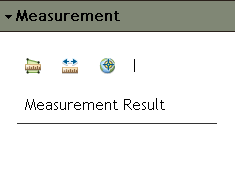 The Measurement widget provides tools for determining the x,y location and measuring the area and length. Navigation tools that allow you to move through selected features. Several new samples that show the popup in action have been added to the help. The first sample styles the popup to apply a new color scheme. The second sample extends the popup to add a link that runs a geoprocessing tool using the selected feature as input. The PopupTemplate class extends esri.InfoTemplate and allows developers to define templates that include title, description, attachments, images and charts. These components are then organized in a layout that is identical to the popup experience that you get in arcgis.com. Click here to view a sample that uses the PopupTemplate to format the contents of the popup window. Removed the highlighted border that appears around the move on tap. 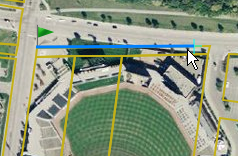 Resolved graphics positioning problems during map navigation.